The mission of the Malmo Plains Community League is to enhance the quality of life of people living in the Malmo Plains neighborhood by providing facilities and opportunities for sports, recreation, social, and community activities. The Malmo Plains neighbourhood is located in south Edmonton, 9km from the downtown core. From the mid-1960s to 2004 the neighbourhood was comprised of 608 single-family homes and 530 townhome and apartment residences. In 2004, 99 condominium apartment residences were added. Currently under construction is a 611 unit apartment complex that will, in phases, increase the number of families living in the community by 50%. This infill of families will increase the size of community events to beyond the capacity of the current community centre building. More people in Malmo also increases the need for a more versatile building. There is no other recreation or community centre in, or planned for, the Malmo neighbourhood. As the Malmo housing stock ages, and the new apartment development comes on stream, rental units will approach 75% of all residences in the neighbourhood. Our goal as a community league is to create a sense of belonging, involvement, and community with everyone--renters and home-owners alike. Key to achieving this goal will be the renovated and expanded Malmo Plains Community Hall. The Malmo community hall building was constructed in 1965 and renovated in 1980 and in 1995. A 2010 assessment of the building by Stantec Engineering revealed that the building, while structurally sound, has interior and exterior fixtures and finishes that require updating. This assessment has been confirmed independently by professional architects. The objective of the project is to create a community hall that, for the foreseeable future, serves the needs of an evolving, diverse urban neighbourhood. Driving this project is the desire to engage neighbourhood families, and especially youth, throughout the year. 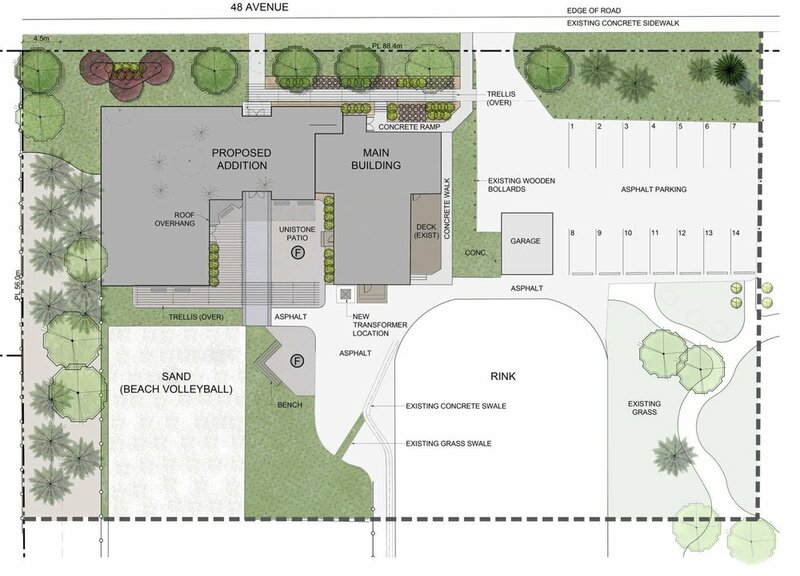 We envision a community hall that is a four-season venue for all manner of (a) outdoor sports and activities and (b) indoor community events and programs. We support the City’s goals for walkable communities, so we see the majority of hall users walk or ride their bicycles to and from the facility. Lastly, we see a hall that incorporates modern standards and technology for electricity and natural gas usage efficiency. • A main hall that is significantly larger than our current hall and is rectangular in shape. • The ability to hold multiple events simultaneously, without them disturbing each other. • A north-facing elevation that fits into the neighborhood, when combined with landscaping. 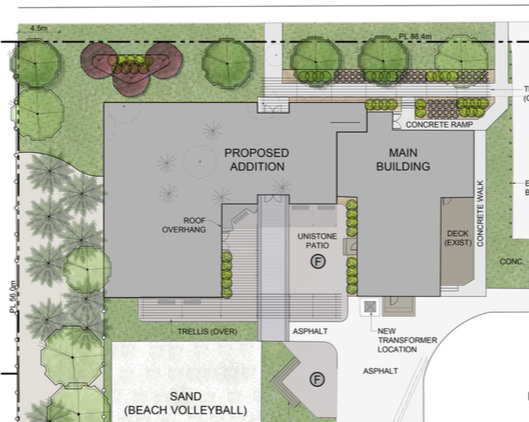 • A south-facing elevation that allows engagement with the sand volleyball courts, skating rinks, and sports fields–perhaps with a courtyard or deck. • A design that supports the four-season, indoor and outdoor vision for the venue. 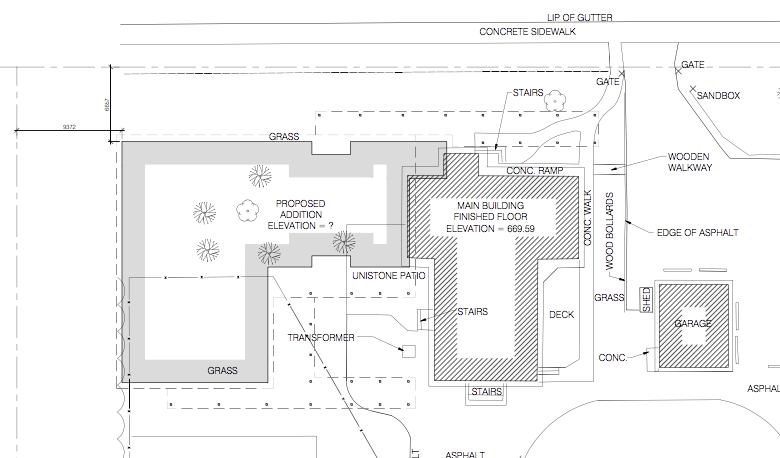 The concept drawings (PDF: Site Plan, Main Floor Plan, High Quality Rendering, Perspective) are intended to show general size and layout of the design, to be evaluated against the instructions given to the architect. The construction design is subject to change. The budget is driven by the funds we can reasonably expect to assemble. Below is the budget for the project. The timelines for the project’s remaining major milestones are below. The primary risks to the project are the denial of grant funding. Our mitigating strategy is to write the most compelling grant applications possible. Phasing the construction project is also an option. A second key risk is our ability to incorporate in the final design the requirements placed on development on City of Edmonton parkland. The Malmo Community Center Hall is undergoing a face-lift, inside and out! By 2017, Malmo will have a new hall that will aim to meet current and future needs of our growing community. In our June newsletter, Malmo residents received a survey insert on yellow paper. Thank you if you submitted it by the June 30 deadline. If not, we have provided it to you online. Please take a few minutes to fill it out before July 31st, 2015.